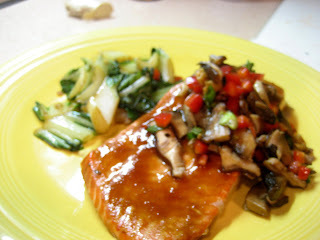 The glaze for the salmon was OK, but I've had better sweet asian glazes. What was really outstanding about this dinner was the roasted mushroom salad. It has a little asian vinaigrette and a fresh crunch from red bell pepper and scallion. I will definitely make it again. I also like recipes that are a complete composed dish; so that made this salmon prep good too. I served some sauteed baby bok choy on the side. Gotta have the greens.